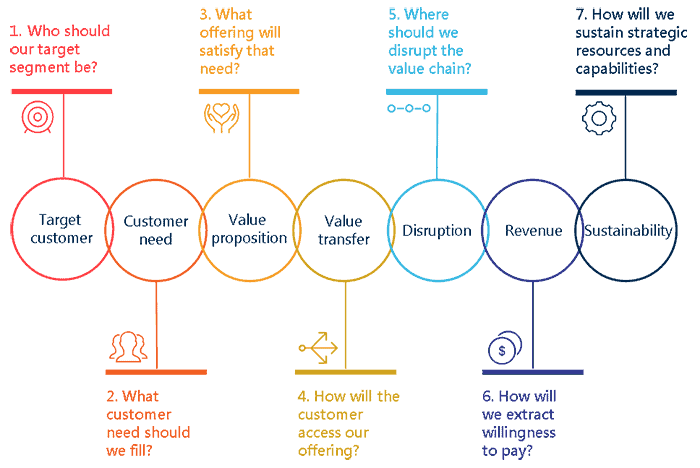 Business model innovation is a critical strategic consideration for organisations facing increased competition in a complex and dynamic operating environment. A business model encompasses a finite set of choices. It defines how the most important parts of a business work together – how something valuable is created through the resources you have and the activities your people do; how this value is provided to customers through relationships and channels; and how the customer’s willingness to pay can turn into profit for the business. A good business model will achieve this in a sustainable way that shuts out competition for the long term. While the business model is not strategy in itself, it is informed by market, customer and competitor analysis, and is defined by a set of strategic choices. When working through these questions, leaders should consider innovative business models that provide strategic agility and meet new needs in new ways. Innovative business models meet new customer needs in ways that were, until now, technically infeasible. This creates new opportunities to connect with customers and grow. An organisations innovation strategy should be designed to enable the development of new business models with strategic agility. Simply encouraging continuous improvement, exploring new markets and developing new products and services is not enough. CREATE THE SPARK: Extend beyond resource networks into ideas networks – seek ideas and inspiration from outside traditional networks to stimulate new opportunities. This can involve taking teams to unrelated organisations, creating collaborative partnerships and bringing other organisations into the workplace to share insights and stories. I was recently invited to participate in a company-wide innovation hack at a leading digitally native listed company. Staff would partner with unrelated organisations to develop growth hack ideas that would never surface without the unlikely connections these collaborations formed, and some of the ideas and models were truly different and exciting. UNEARTH NEW NEEDS: Observe beyond the customer purchasing cycle – business model innovation can come from new and unmet customer needs. To identify these needs, organisations can observe customer behaviour and experiences upstream and downstream of the key touch points with its products or services. SEEK BLUE OCEANS: Search for associative customer needs and pain points – look outside of the industry and target customer base to find common needs or pain points across segments. 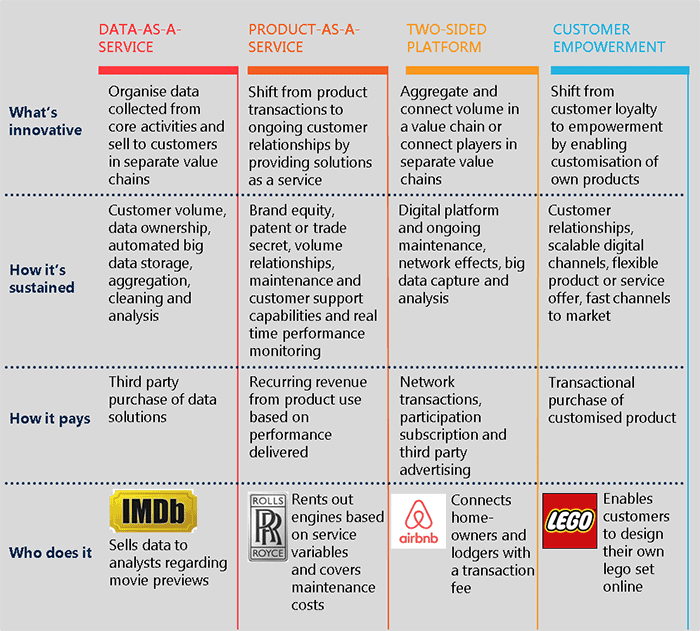 These can lead to business models that serve larger target addressable markets that are currently not being served by existing organisations. Nous recently worked with a national housing provider to help it identify, develop and launch a new product opportunity. We looked at needs, opportunities and pain points drawn from issues of housing affordability, lifestyle trends, the sharing economy and IoT, to develop a unique product that can quickly expand a small, niche market. EQUIP A LEADER: Allocate leadership for business model innovation within a supported environment – create the space for an individual to think beyond product and service innovation. Ensure the capability, resources, willingness and support required to identify new customer needs that can be met using existing resources and capabilities. Truly question the identity of the business and rethink its fundamental DNA. PRIORITISE LEARNING: Develop a culture and processes that enable rapid experimentation – develop new business models using small scale trial and error. This can be done by designing, prototyping, developing metrics and testing against these. This kind of experimentation will enable constant iteration and learning and minimise the risk of material change. Get in touch with Nous Group's strategy and innovation experts if you would like to explore how to establish an innovative business model that builds on your capabilities, resources and customer base.